Homeopathic remedies can successfully treat a person with pesticide exposures and other toxic exposures. Pesticides kill 220,000 people worldwide each year. These toxins are sprayed onto all types of plants and produce and cause significant harm to the immune systems of people and animals ingesting them. Homeopathy can naturally reduce pesticide toxicity and bring the body into a better health balance and wellness. A healthy diet should focus on pesticide free, non-GMO, organically grown produce, dairy and meats as much as possibel. 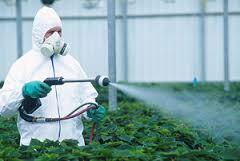 Pesticide exposure causes anxiety, diarrhea, breathlessness and weakness. serious reaction including anaphylactic reaction after exposure to formaldehyde or other toxins. generalized protection from poisonings, asthma from pesticides with spasms of breathlessness.